Since my sister and brother in law moved into their current home, I’ve slowly been helping them furnish and decorate each room. When they were expecting their first child, I wanted to do something really special. I put together two proposals based on themes my sister was considering. The giraffe spot wall won us all over on the Safari Nursery theme, and Diana and I embarked for St Catharine’s for a weekend-long project painting spots on the wall. The end result is fabulous! How we did it: Colours were selected from the bedding. Green walls and the cream base were pre-painted by my sister. A quick Google search brought up loads of giraffe prints. We selected our favourite and projected on the wall to trace out in pencil. We used a 1″ angled brush to trace the outlines of the spots. Using a good quality, professional brush really made a difference. Diana swears by Picasso brushes, available locally at New Canadian’s Lumber on Dupont. The high quality bristles glide over the wall, creating crisp outlines. For the giraffe spots, two people traced, and one person filled in the spots with a wider brush. Everything needed two coats. 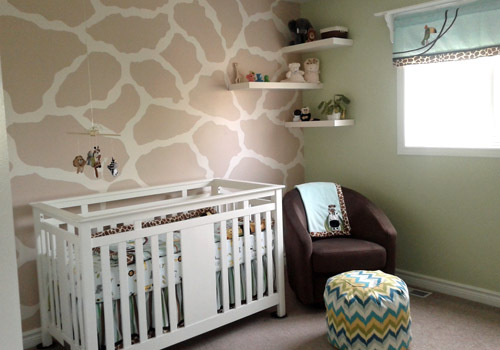 We were glad to be a team of three, and that we opted to do just one wall for the Safari Nursery!